Atrial Septal Defects are divided into three different types on the basis of the position of the hole (or holes) in the atrial septum. The first type of ASD is known as ostium primum defect, or simply, primum (number 1 in the diagram). In this kind of defect, the hole is located in the lower part of the atrial septum, near the tricuspid valve, which opens into the right ventricle. The most common type of ASD (accounting for 50-70% of all cases) is known as ostium secundum defect, or simply, secundum (2). 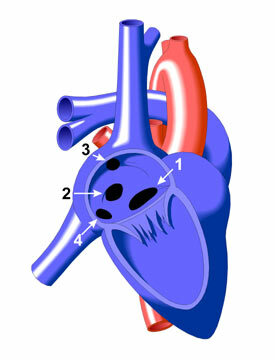 In this case, the hole is located near the center of the atrial septum. The third type of ASD is known as a sinus venosus defect, in which the hole is located near one of the two places where the vena cava (the vein that carries blood from the body to the heart) enters the right atrium. The two kinds of sinus venosus defect are distinguished by whether the hole is near the entry point of the superior vena cava (SVC) (superior vena caval type - 3 in diagram) or of the inferior vena cava (IVC) (inferior vena caval type - 4 in diagram).